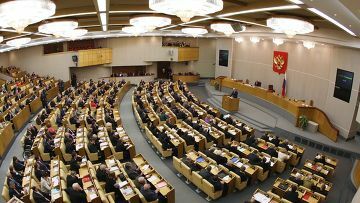 Russian lower house to review amendments to foreign investments law | Russian Legal Information Agency (RAPSI). Moscow, April 18 - RAPSI. Russia's lower parliament house, the State Duma, may review amendments to the law on foreign investments in strategic enterprises this week. The new regulation will make the purchase of assets through offshore entities easier for Russian companies, Andrei Tsyganov, the deputy head of the Federal Antimonopoly Service (FAS), told media. He added that the FAS developed the amendments on offshore purchases by Russian companies and investments by foreign financial organizations upon President Dmitry Medvedev’s orders. According to the amendments, applications to the FAS will not require considering by the Foreign Investment Commission. Tsyganov said the document is now passing through inter-agency approval. The FAS is already receiving feedback and is expected to finish the procedure next week. The document will then be forwarded to the State Duma. Tsyganov believes the first portfolio of the amendments will be adopted, as it has already passed the first reading in the lower house of parliament. The second portfolio includes a proposal that the threshold value of equity allocation in companies using subterranean resources be increased from 10 to 25 percent and an amendment reducing the list of activities in which deals must be approved by the Foreign Investment Commission from 42 to 13. Tsyganov said the second portfolio’s approval is nearing completion. He does not rule out the possibility that the State Duma will read the document during the fall session. 16:38 18/04/2011 Russia's lower parliament house, the State Duma, may review amendments to the law on foreign investments in strategic enterprises this week. The new regulation will make the purchase of assets through offshore entities easier for Russian companies.